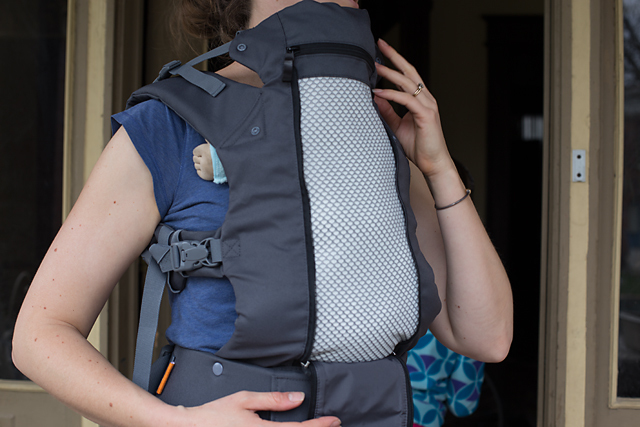 Manufacturers are constantly listening to customer feedback and incorporating new ideas into their carriers, and one of the great things about a babywearing group is that sometimes we get to try out the newest versions! 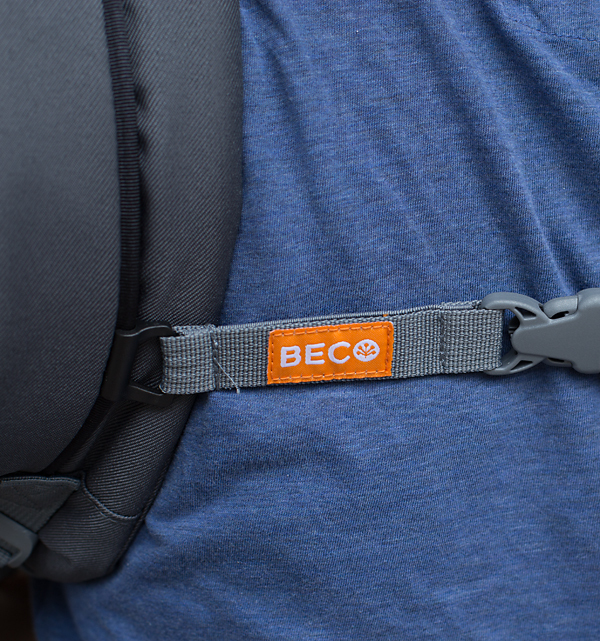 We are fortunate to have the new Beco 8 carrier visiting our group for a few weeks, courtesy of Beco Baby Carrier. 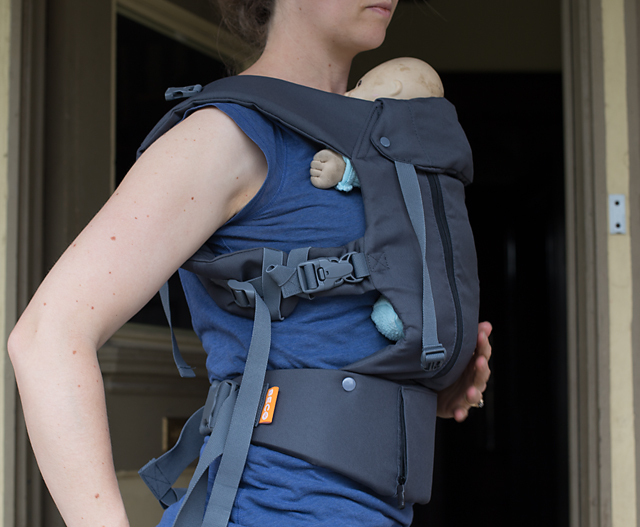 When I started looking at the carrier, I was immediately intrigued by the infant insert. It is essentially just a pillow, but it can be folded and snapped together to a height appropriate for babies 7 – 10 lbs, or used flat for babies 10 – 15 lbs. 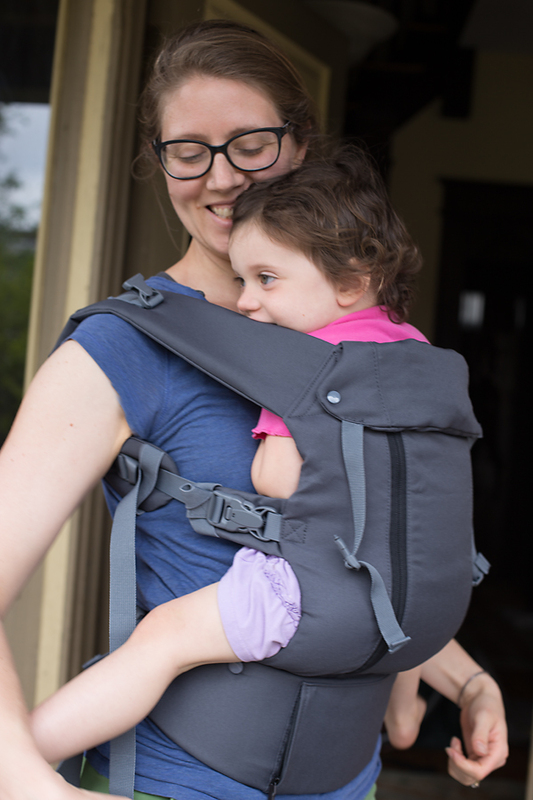 Then the carrier has both a narrow and wide seat option which means this one carrier can take you from infancy to toddlerhood. 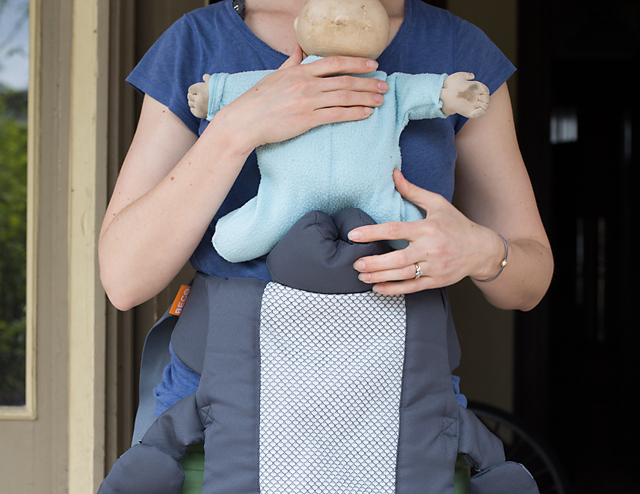 Since I don’t have any newborns in my house, I grabbed my toddler’s baby doll (with an inexcusably dirty head – please disregard) and tried the Beco 8 with the infant insert folded for smaller babies. I was surprised to see that even this small baby doll actually fit quite nicely in the carrier! And the folded pillow still put it at a great height in the carrier! 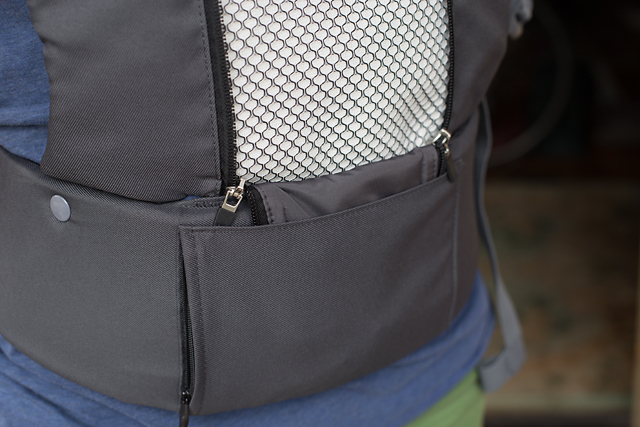 There is a panel in the center of the carrier that zips down to reveal an “airflow” panel so it should be a little cooler on hot summer days. Plus, the fabric that is zipped down stores nicely in a little pocket on the waistband. And can be tucked into a pocket on the waistband for storage. In addition to that storage for the zip panel, there is a zipper pocket on the waistband large enough for a phone and keys. Another nice feature is the way the chest belt is attached to the carrier – it is clipped onto the piping on each shoulder strap and slides up and down easily to adjust the height of the chest clip, but stays in place also! Of course once her baby doll had a turn, my toddler had to go up! She’s about 28 pounds right now, and fit comfortably in the wide seat setting. If she still wanted to be worn every day, I would probably size up to a toddler carrier for her, but this would definitely work as long as her legs were comfortable. She rode around for about half an hour and we were both comfy the whole time. Here the neck rest is snapped down – a good height for her arms to go in or out. Here the neck rest is up but I haven’t clipped it in place. There is also a sleeping hood still in it’s pocket! 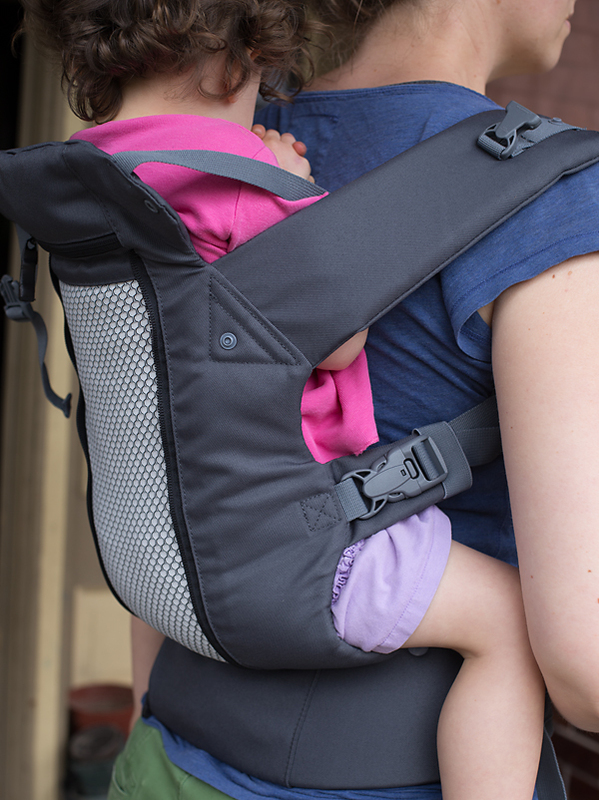 If you’re in the market for a new soft structured carrier, this could be a great option! I like the dual-adjust buckles on the shoulder straps, the mesh panel, and the shoulder straps can be crossed if you prefer. The infant insert is effective without being bulky, and the two width settings on the seat panel mean this should work from baby to toddler, and can also accommodate a baby who likes to ride front facing out. Since this carrier is travelling, it is not available for checkout from our library, but it will be at the next two meetings at least if you would like to try it on! Many thanks to Beco for sending this carrier travelling to our group!